Automotive Service Center Technician is a two-year program which prepares students for entry level positions in the automotive repair industry and for further study in post-secondary programs. 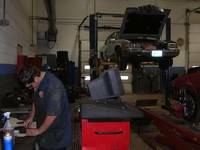 Students train to diagnose and repair automotive computer, electrical and mechanical failures using the latest equipment and procedures. The theory of automotive systems is explored through classroom instruction, providing the student with a working knowledge of the ever-changing technologically advanced automobile. Skills acquired in this program can also be applied to alternative careers in the automotive field. Many will find that their training will allow them to pursue careers in the motor sports or personal motor sports industries. Through class work, tests and hands-on shop work, students study the art of being world-class mechanics. Shop work, as part of the curriculum, provides students with “real” work. 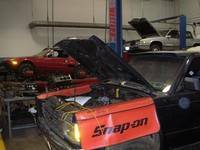 Approximately 30 percent of all shop work is through people in the community. Students wishing to pursue Automotive Technology need to be motivated, patient, and able to follow multi-step instructions. Students will also work independently, as well as within a group; be willing to take initiative and follow through until their work is completed. Students must be consistent about safety precautions and wearing the required protective eyewear and clothing. SkillsUSA is a student organization that develops leadership abilities and gives students the opportunity to participate in competitions in their vocational areas.